High performance portable receivers integrated in to robust Pelicases allow for rapid deployment in situations where local ground personnel need to see images from the transmitting aircraft. 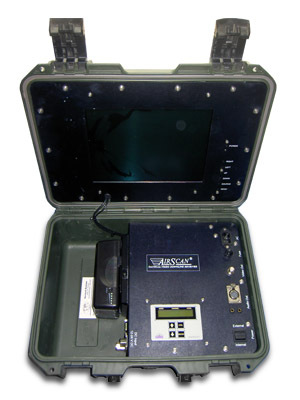 In such applications where quick deployment is required, the “Grab n Go” briefcase receiver system provides for almost instantaneous reception of pictures from the helicopter video down link transmissions or terrestrial vide links. Housed in a rugged Storm/Peli ® case, the ground receive case is designed to be hand carried or in vehicles such as police patrol cars and incorporates a microwave receiver, optional Viewlock decryption and 10.4” LCD outside viewable monitor. The system is ready for use as soon as power is supplied to the case, which may be from the 12 volt vehicle supply or from an ac line supply. The unit is supplied with a 5dBi hemi-omni mag mount antenna to allow ease of antenna deployment. Reception from distances out to 10Km or more (subject to line of sight between the antenna and the aircraft) is achievable. The system is ideal when circumstances mean that a transmitting unit is operating out of range of a fixed site. The “Grab n Go” provides an ideal alternative.